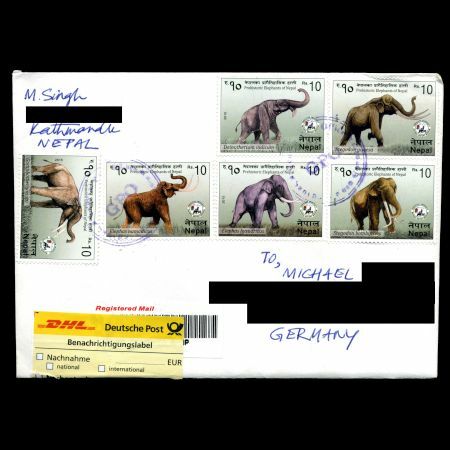 Nepal 2015 "Prehistoric Elephants of Nepal"
Paper Security Stamp paper UV dull with visible & invisible fibers & phosphorescent dots. 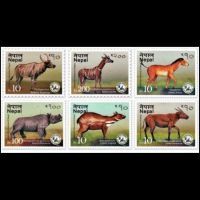 On July 7, Post Authority of Nepal in cooperation with Natural History Museum of Nepal issued the second stamp set of prehistoric animals. Distinguished from the set from 2013 this set is dedicated to one group of animals only: prehistoric elephants. 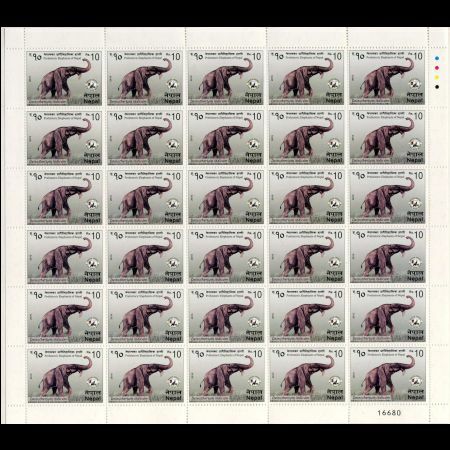 Stamps presentation took place on the same day in the museum. Special Guest Prof. Dr. Ishwar Chandra Dutta, Chairman of Tribhuvan University Service Commission. Chairperson Chirika Shova Tamrakar, Dean, Institute of Science & Technology, Tribhuvan University, Drona Pokhrel, Director General of Postal Service Department, Secretary of Ministry of Information and Communication Sunil Bahadur Malla. 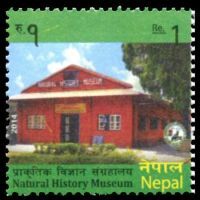 Prof. Dr. Ramesh Shrestha, Chief, Naturl History Museum, Swayambhu. 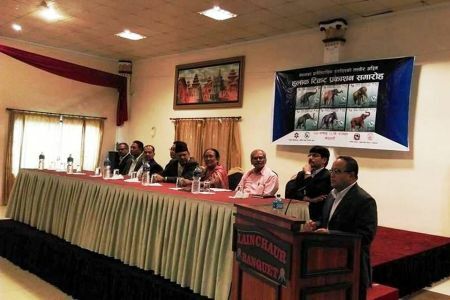 Prof. Dr. Ramesh Shrestha, Chief, Natural History MuseumMr. 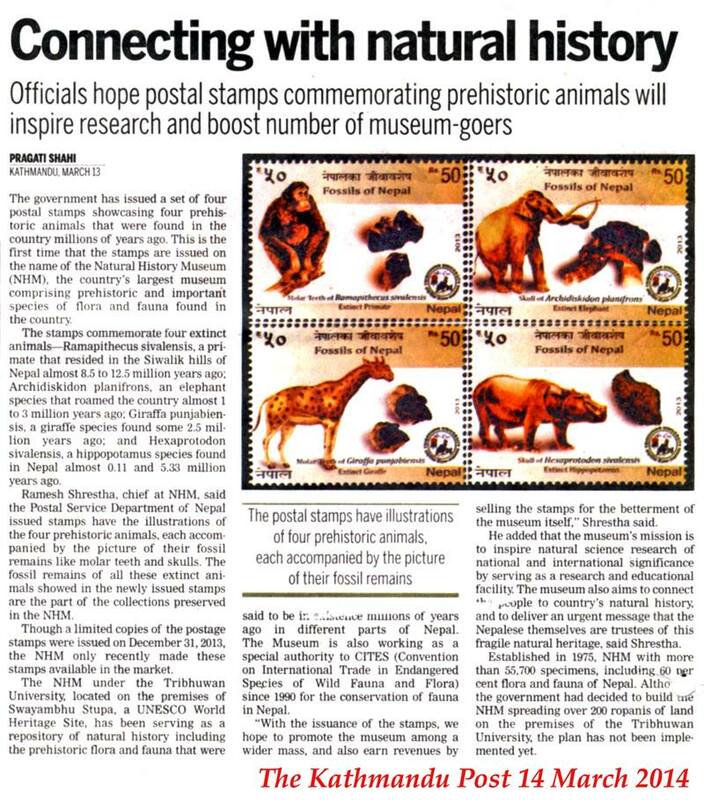 Shankar Shrestha, who also consulted stamp designer, has a speech. First Day Cancellation by Chief Guest Honorable Minister Dr. Minendra Rijal. 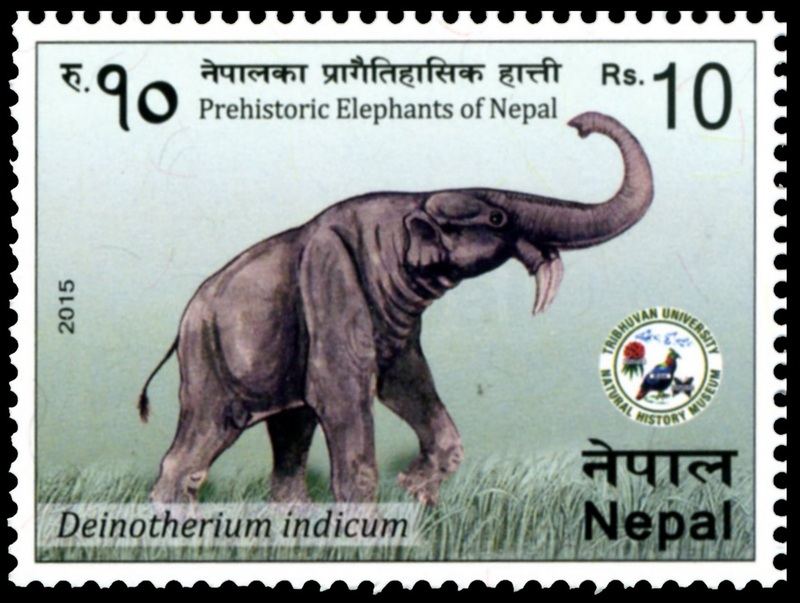 Nepal, as part of the Indian sub–continent, remained an important place for the evolution of elephants since Miocene some 24 million years before present (MYBP). Many Palaeontologists have discovered various body parts of these Proboscideans since a long time from different part of the country. 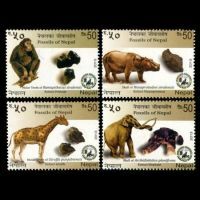 Up to now in Nepal fossils of seven Proboscideans have been found. 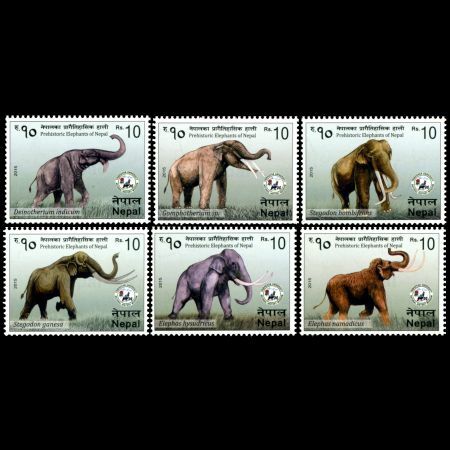 The Proboscidea order encompasses the mammals with long muscular trunks. At the present time, there are only two Proboscidean species alive. 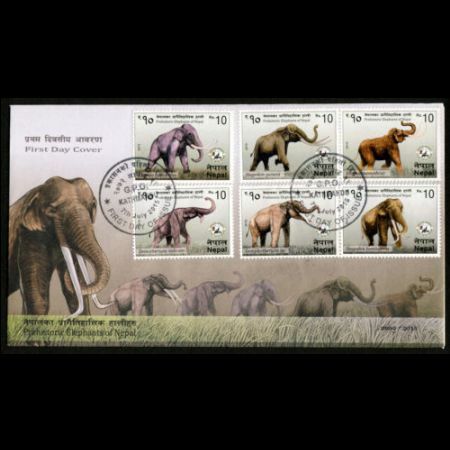 One of them is the Asian elephant (Elephas maximus) found in mixed habitat zones in Sri Lanka, India, Nepal and parts of Southeast Asia. The other one is the African elephant (Loxodonta africana) found in Sub–Saharan forests and grasslands. Deinotherium indicum (Family: Deinotheriidae): Deinotherium also known as a ‘terrible beast’ was a large prehistoric relative of modern–day elephants that appeared in Late/Middle Miocene and survived until Early Pleistocene. Deinotherium evolved from the smaller early Miocene Prodeinotherium. Its trunk was shorter and it had downward curving tusks attached to the lower jaw. 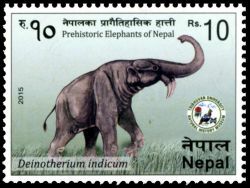 Three species of Deinotherium giganteum in Europe, Deinotherium bozasi in Africa and Deinotherium indicum in India, Nepal and Pakistan are known. The molar tooth of Deinotherium was discovered at Babai River by Dr. Robert West & his team 1978, in west Nepal. This molar tooth is in the collection of Natural History Museum. Gomphotherium (Family: Gomphotheriidae): is called welded beast, which evolved in the late Oligocene/early Miocene of North America from 13.650 to 3.6 MYBP living about 10 million years. The genus immigrated into Eurasia and Africa after a drop in sea level (probably during the Tortonian epoch) allowed them to cross over. It survived into the Pliocene and its remains have been found in many countries including Nepal. These animals probably lived in swamps or near lakes using their tusks to dig or scrape up aquatic vegetation. 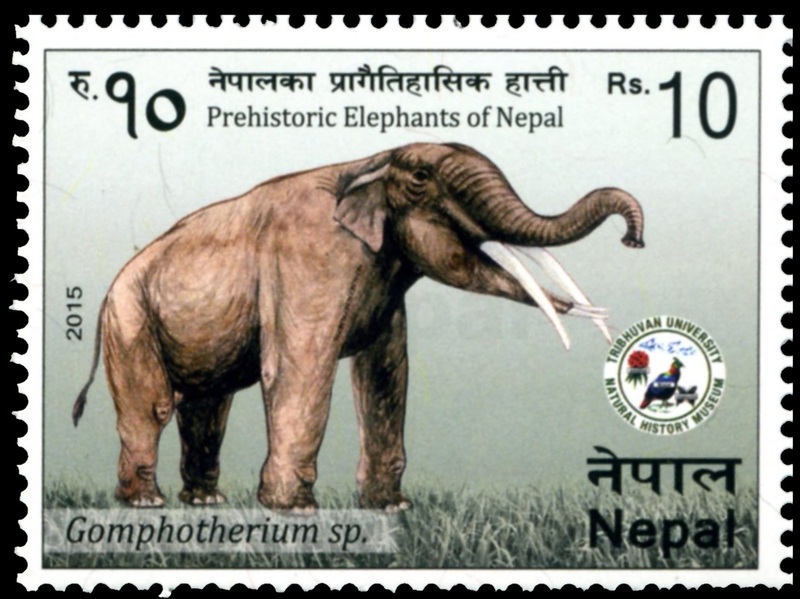 Several fossils of Gomphotherium are reported from Babai River by Dr. Robert West and his team in 1978 and Surai Khola by Dongol in 1985 and again by Gudrin Corvinus in 1988 in Nepal. 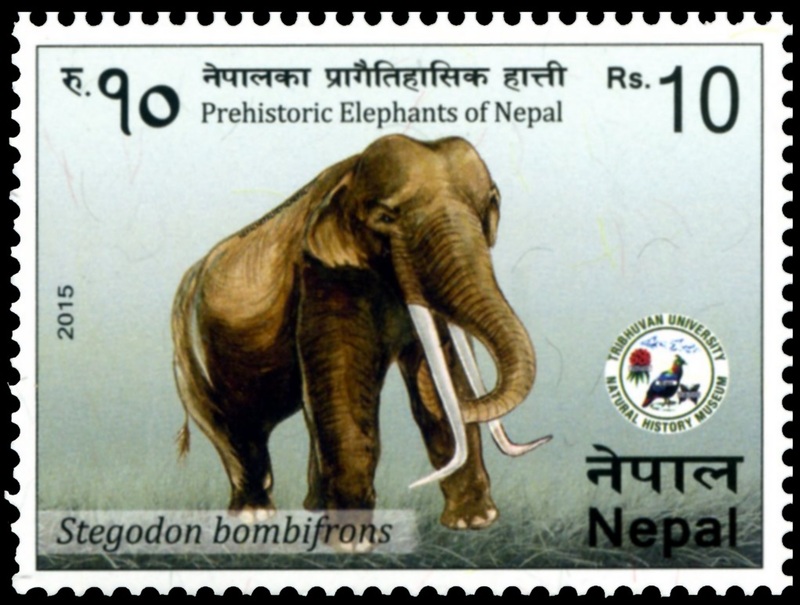 Stegodon bombifrons (Family Stegodontiidae): The Gable–toothed Elephant or Stegodon bombifrons is the initial stage of the true elephant family, or more correctly, the transition from Mastodon to Elephant. 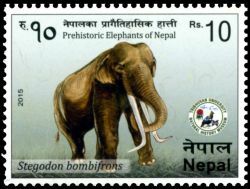 In Bardia National Park in Nepal, there is a population of Indian elephants which, possibly due to inbreeding, exhibit many Stegodons like morphological features. 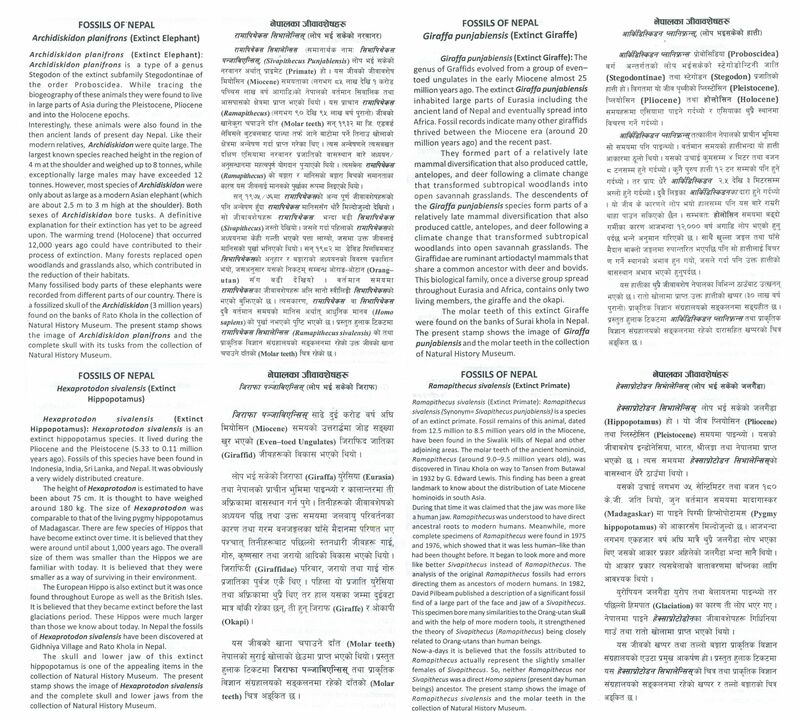 Some dismiss these primitive features as recent mutations rather than atavisms. 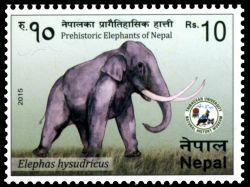 Gudrin Corvinus found the skull of this elephant at Rato Khola, in Nepal in 1988. 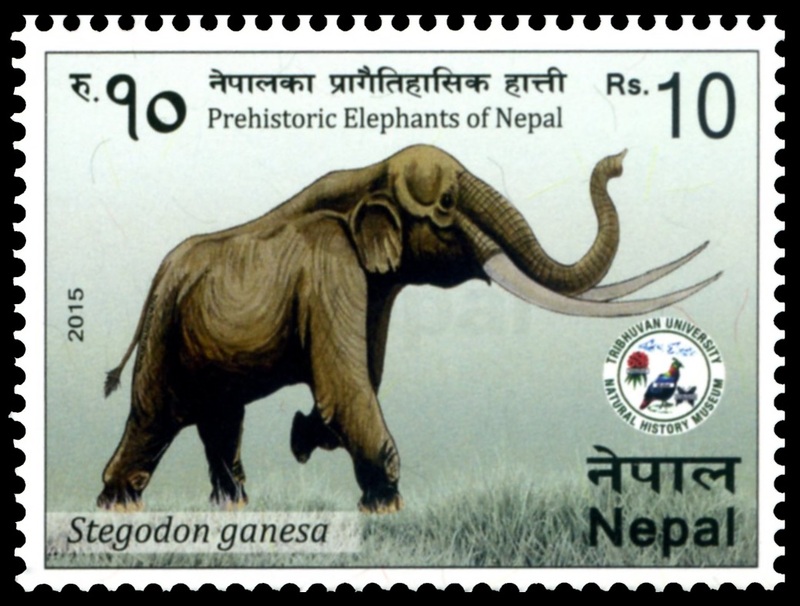 Stegodon ganesa (Synonym Stegodon insignis) (Family Stegodontiidae): Stegodon, also known as roofed tooth elephant, is the genus of the sub family Stegodontinae. Although it was assigned to the family Elephantidae by some authors, but it has more comfortably been placed in Stegodontiidae due to its certain features which are more towards stegodons than true elephants. In some individuals the tusks were so close together that the trunk probably did not lie between them but instead draped over. 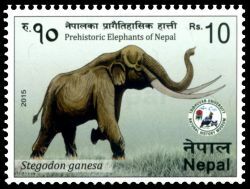 The molars of Stegodon ganesa are reported from Kathmandu valley (Sharma & Singh, 1966 and Corvinus, 1988) and Babai Khola (West & Munthe, 1981). 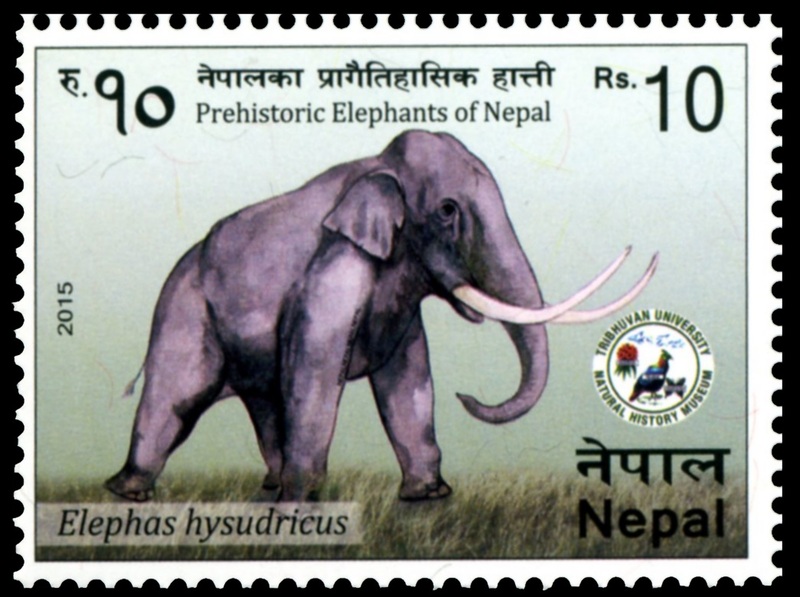 Elephas hysudricus (Synonym: Hyselephas hysudricus) (Family Elephantidae): Elephas hysudricus is an extinct elephant species and was described from fossil remains found in the Siwalik Hills. It lived during the Miocene and Pliocene epochs. 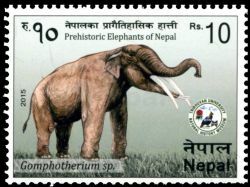 The molar teeth of Elephas hysudricus has been reported from Kathmandu valley by Dongol in 1987. 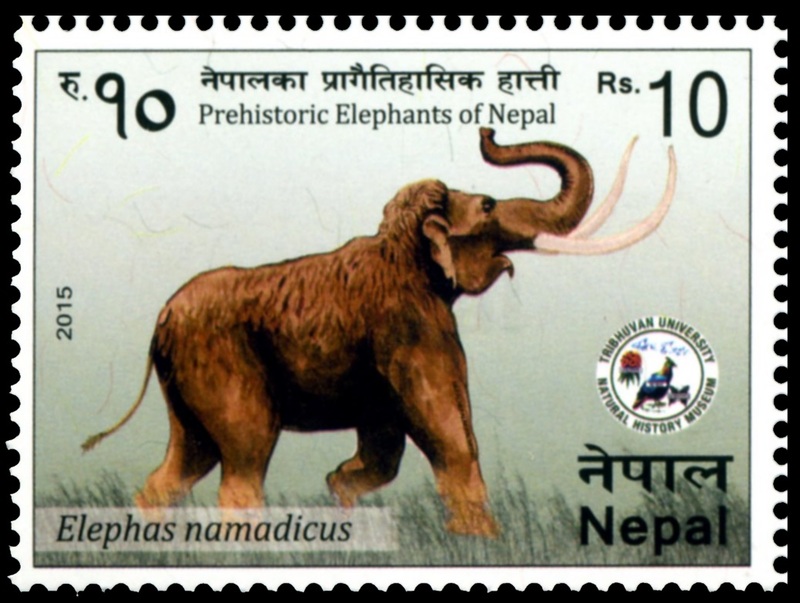 Elephas namadicus (Family Elephantidae): Elephas namadicus was a species of 2.1 metre–tall prehistoric elephant that ranged throughout Pleistocene Asia from India (where it was first discovered) to Japan where the indigenous Neolithic cultures hunted that particular subspecies for food. 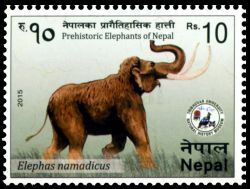 Elephas namadicus is a descendant of the Straight-tusked elephant. The molar teeth of Elephas namadicus was discovered from the alluvial deposits of Binai Khola near Pidari village at Dumkibas in Nawalparasi. 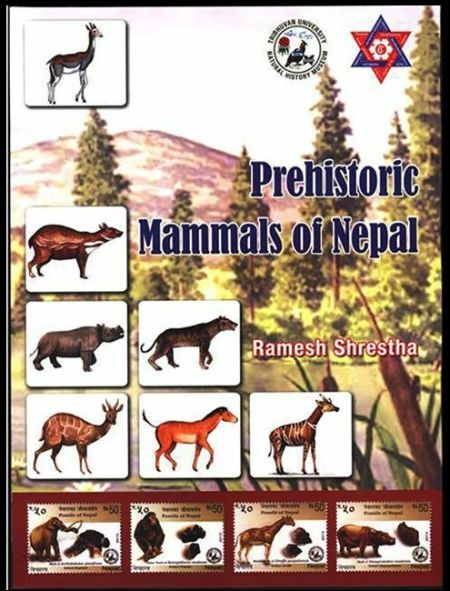 Book: "Prehistoric Mammals of Nepal" Paper back Published by Natural History Museum Language: English Pages 10 +114 = 124 Colour: 12 pages. 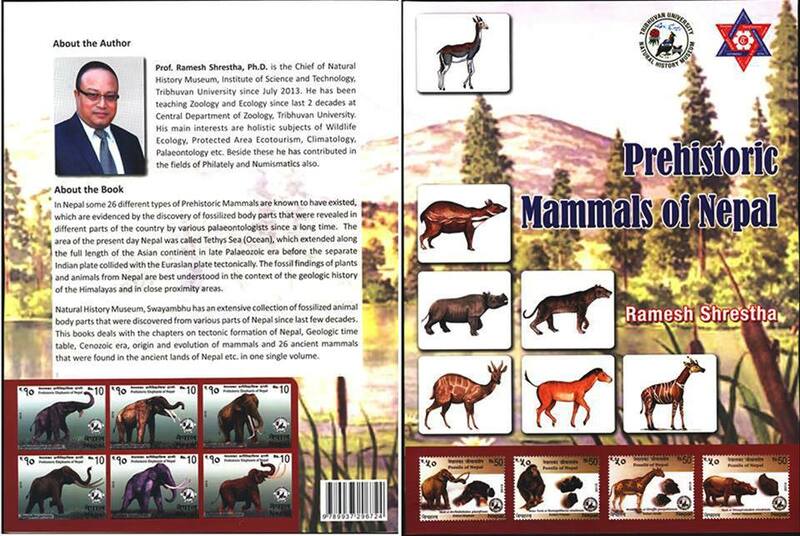 The book is written by Prof. Dr. Ramesh Shrestha, Chief, Natural History Museum, who also consult the stamp designer and is about all 26 different types of prehistoric mammals are known from fossil evidences found in Nepal. 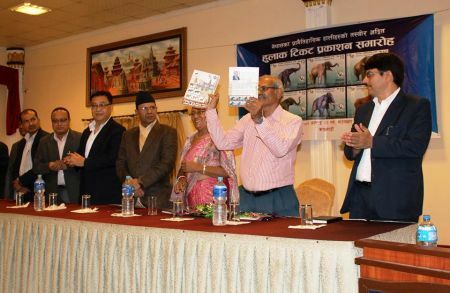 Release of the book: Prehistoric Mammals of Nepal by Ramesh Shrestha. Released by Prof. Dr. Ishwar Chandra Dutta, Chairman of Tribhuvan University Service Commission. Acknowledgement: Many thanks to Prof. Dr. Ramesh Shrestha, Chief, Natural History Museum for his support.